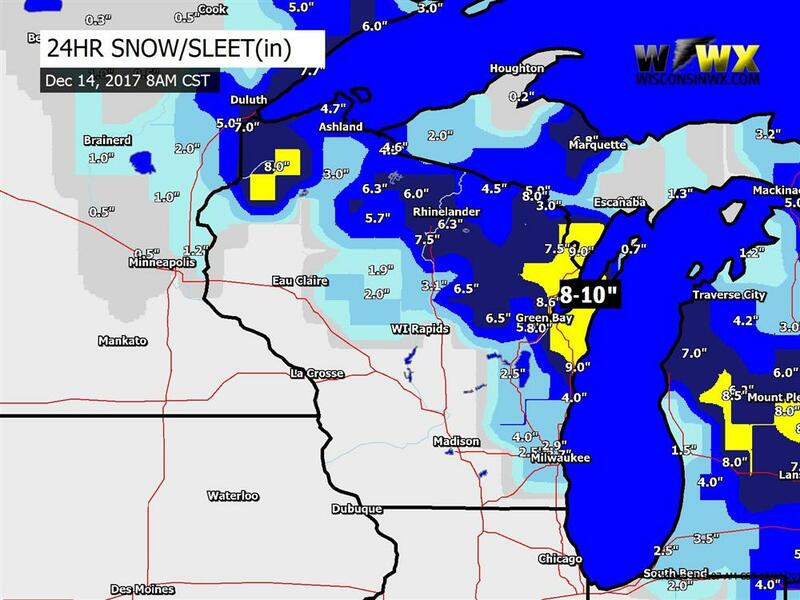 8-10" of snow fell north of Green Bay on Wednesday, December 13 2017. Snow reports of 10.0" in Two Rivers, 9.7" in Sturgeon Bay, 8.6" in Abrams. Our forecast called for 3-6" with locally higher amounts in northeast Wisconsin. Missing a couple data points in northeast Wisconsin but it don't matter. There was a pretty sharp cutoff in accumulations across central Wisconsin with 0-3" south of that line and 4-8" north of it. After it looked like southeast Wisconsin might escape accumulating snow, snow arrived east of Madison. Statewide statistics show that 531.2" of snow was reported on 132 storm reports with an average of 4.0" per report. 40%(53) of reports were in the Green Bay(GRB) NWS WFO, 36% in Duluth (DLH), and 19% MKX. 30%(39) of reports statewide came from the general public. 26% from trained spotters, 24% COOP or CocoRahs. Brown County in northeast Wisconsin had the most reports (13) but the county of Ashland was the most efficient report producer with 1 report for every 435 people, a total of 8 reports. Good job Ashland county!